The main focus of the water quality program is to monitor the status of the North Canadian River. This water resource is interconnected with other water resources on tribal lands. Each month program staff measure dissolved oxygen, pH, specific conductance, turbidity, temperature, nitrate/nitrite, total phosphorus, and E. Coli in the river. We also respond to complaints or concerns regarding other surface water resources such as creeks or ponds. The main focus of the water quality program is to monitor the status of the North Canadian River and tributaries within the tribal jurisdiction. This water resource is interconnected with other water resources on tribal lands. Each month program staff measure dissolved oxygen, pH, specific conductance, turbidity, temperature, nitrate/nitrite, total phosphorus, and E. Coli in the river. We also respond to complaints or concerns regarding other surface water resources such as creeks or ponds. Predominantly the Kickapoo tribal lands lie within the Lower North Canadian Watershed. The northern border of the jurisdictional area is bounded by the Deep Fork River, a tributary of the North Canadian River, and the southern border is bounded by the North Canadian River. The headwaters of the Deep Fork River are in north Oklahoma City; the North Canadian River passes through Oklahoma City prior to entering the jurisdiction. Rivers and streams within the jurisdiction are utilized for cultural and agricultural uses. Cultural practices such as gathering of aquatic plants and wildlife, particularly fish, are common within the Tribe. Agriculture consists primarily of open pastures for cattle with some cultivated land. Two principal aquifers, the Garber-Wellington Aquifer and North Canadian River Aquifer, provide ground water for most rural dwellings and small communities. The Kickapoo Tribe relies primarily on the groundwater resources within the tribal boundaries for domestic and commercial uses. Water management in the Oklahoma City metropolitan area greatly impacts the quality of the Tribe’s surface water resources. Upstream urban impacts include stormwater runoff (MS4s), municipal wastewater discharges, sanitary sewer overflows, industrial discharges, and upstream impoundments. Impacts within the jurisdiction include agricultural runoff, municipal wastewater discharges, and failing private septic systems. From 2009 to the present, the Tribe has monitored the portion of North Canadian River within the Kickapoo tribal jurisdiction. The southern boundary of the area of tribal jurisdiction is bordered by approximately 37.8 miles of the North Canadian River. 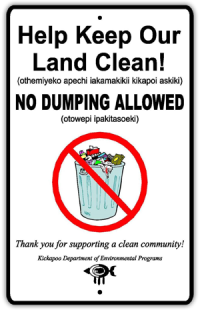 According to the 2012 Oklahoma Streams Report: Beneficial Use Monitoring Program (BUMP)(2013), the segments of the North Canadian River within and near tribal jurisdiction are failing to support most of their designated uses. The data available for stations 520510000110-001AT (Harrah) and 520510000110-005AT (Shawnee), classified within the Lower North Canadian River 8 digit HUC watershed (11100302), indicate that this portion of the river is impaired. During year 2014-2015 we will continue monitoring one site on the North Canadian River, and begin monitor two tributary sites. In 2013 we began receiving base level CWA §319 funding. §319 implementation projects are expected to result in a measurable improvement of water quality. A measurable water quality improvement would be very difficult to achieve on the North Canadian River. As a result, we hope to implement §319 projects on tributaries to the North Canadian River where they are most likely to result in measurable improvement. We would like to begin monitoring tributaries on trust land to collect the baseline data necessary to support the site selection, design, and implementation of §319 projects. Please contact us for any additional questions either by completing the contact form or calling us. Help keep our waterways healthy for future use.